The Miniespai is ACVic's space where toddlers, teenagers, families and teachers can find different books, storybooks with pictures, picture-books, albums or interactive books, to inspire them to create, experiment and play through contemporary art. 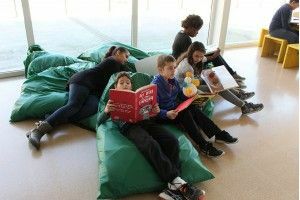 The space also offers – always at no cost – visits for schools, accompanied by a trained educator, so that their pupils and students may learn more about the space. 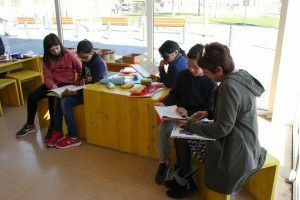 On the 10th and the 24th of March, two groups from 5th Year at Vic's Doctor Joaquim Salarich Primary School came to visit the Miniespai. They were completing an entrepreneurship project in which they put together two cooperatives dealing in compost, and used ACVic's Workshop space to make certain objects which would be of use to the cooperatives. The groups then split up, and each also learned more about the Miniespai. Accompanied by their teacher, they browsed the books in small groups, or on their own.